The Big 5 and its co-located shows return this year with a strong statement, reflecting the resurgence of the regional construction industry and its strong future outlook. 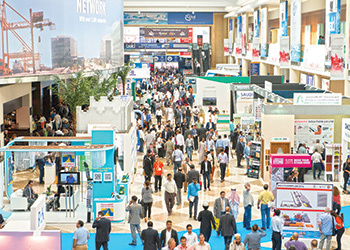 The Big 5 show has not only gained a reputation as a record breaker amongst regional events but also a barometer of activity in the construction sector. And this year’s size of nearly 3,000 exhibitors and 85,000 anticipated visitors speaks volumes about the confidence in the regional market. Set to take place in Dubai, UAE, next month, the largest building and construction event in the Middle East gathers under one roof thousands of products and latest technologies drawing select crowds that include architects, designers, contractors and decision-makers from all across the globe. Last year, the show had more than 80,000 participants from 147 countries. The event has also become a forum for educating people and creating awareness on the latest global trends in the industry. Its seminars and workshops have become much sought after as leading experts expound valuable information at free-to-attend events. It will continue to offer live product demonstrations and free certified workshops led by industry experts and professionals at the forefront of their fields. The 2015 edition of the show, which will be held at the Dubai World Trade Centre from November 23 to 26, has increased in size yet again this year. It will also fill the brand new hall space at the centre with a section called The Big 5 Focus – a key addition, according to a senior official at the event organisers. As in previous years, two major shows will be co-located with The Big 5. These are Middle East Concrete 2015 and PMV Live 2015, the show for all mechanical vehicles involved in construction. Together, the three shows are expected to attract 3,000 exhibitors, representing a 10 increase on the 2014 event. In doing so, they will offer an unrivalled platform for connecting with influential leaders under one roof, gaining real-time insights into the latest trends and emerging needs coming from within the industry, and participating in workshops and seminars that leave visitors more informed and better prepared to meet those needs, according to dmg events Middle East. 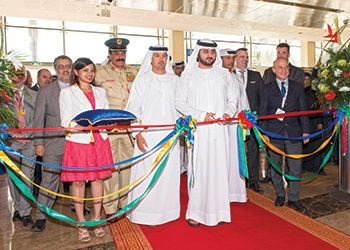 Sheikh Maktoum bin Mohammed binRashid Al Maktoum, the deputy ruler of Dubai, inaugurated last year’s show. The annual event gauges the regional construction industry, which has seen a rebound, prompting a wave of renewed confidence in the market and has been accompanied by strong investment from across the government and private sectors. “Together with sovereign wealth funds of $291 trillion, this investment has come despite low oil prices and can, therefore, be considered as an indication of a construction market that is maturing and diversifying at an electric pace,” says a spokesman for the organiser. 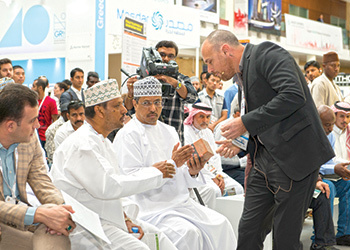 Providing an insight into the construction sector of the region, he says: “In 2015, contractor awards in the building and infrastructure sectors are estimated to reach $141.38 billion, and as the regional population and purchasing power continue to soar, GCC governments are increasing their budgetary allocations to achieve further diversification. In doing so, changes are ringing in across the board, with education, healthcare, infrastructure, retail, leisure, and transportation all set for major transformations over the next 15 years. “At the heart of these developments is a desire to improve the lifestyle of the region’s local and expatriate populations, as well as efforts to promote the region as one of the world’s leading destinations for retail and hospitality. However, while traditional hotspots for retail and tourism like the UAE are expected to continue to succeed in attracting the gaze of the world, Qatar and Saudi Arabia are also cutting their teeth when it comes to plans for constructing some of the most ambitious and eagerly-awaited hotel projects. “Heavy government investment in promoting its tourism has led Saudi Arabia to build a pipeline of hotel projects and it expects to complete 16,000 new hotel rooms in Riyadh and Jeddah alone by 2018. “In a similar vein, Qatar Tourism Authority has announced its target to attract seven million visitors a year by 2030, as part of the Qatar National Vision 2030. Unlike Saudi Arabia, hosting global sports events will be an important part of Qatar’s economy diversification, and the 2022 Fifa World Cup and 2019 World Athletics Championships are currently driving future hotel pipelines. This pipeline includes plans to build approximately 80 new hotels and hotel apartments over the next five years in anticipation of a surge in visitor numbers. “Another key enabler of economic diversification that is driving growth in the construction sector is retail. GCC retail markets and sales are expected to continue growing steadily, with the industry poised to reach $221 billion by 2015. According to 2015 data published in Alpen Capital’s report on the GCC retail industry, sales are also forecast to grow annually by over seven per cent a year until 2018, reaching a total of $284.5 billion. Importantly, for construction sectors, the opening of new malls and shopping destinations will support this growth. “Connecting the dots, and acting as the vital links in the chain, are the numerous large-scale infrastructure projects that are being constructed across the region. Given the promising outlook that these growth markets present, demand for certified equipment, building materials and expertise is expected to rise exponentially. In response to the booming regional construction market, the biggest names in the construction machinery sector will be at PMV Live this year where MAN Truck and Bus has chosen the event to celebrate its 100 year anniversary. “This is a fantastic testament to the importance big global companies attach to events like PMV Live and the connections it helps them to create within the region,” says Waugh. “One of the things that makes Middle East Concrete and PMV Live so popular is the fact that the events are considered to be the must-attend platform for major players representing the entire industry,” says Waugh. “The global construction equipment market is forecast to reach $241 billion by 2020 and growth in the Middle East is a major part of this figure. A demonstration under way ... at last year’s edition. And with so much to learn about new products, technologies, and techniques, the topic of sustainable construction and suitable materials will be a key focus of The Big 5 this year. As in previous years, the four-day exhibition will feature a series of high-quality, free certified workshops, with visitors guaranteed access to at least 64 workshops. Workshops will be led by industry speakers with in-depth knowledge on the regional construction industry, including sustainability, business and market intelligence, design and architecture, affordable housing, and sustainable communities, and technology in construction. More specifically, workshops will explore UN Global Compact principles related to sustainability and ethics in real estate construction, as well as updates on Dubai green building regulations, materials testing, certification, and best practices, and a series of in-depth introductions into the theory and practice of lifecycle costing and assessments for green buildings in the GCC. • Lifecycle costing: Theory Vs practice in the GCC region (November 26 at 12 noon). Further information on the free workshops and industry speakers taking part at The Big 5 can be found at https://www.thebig5.ae/free-education/certified-workshops/agenda/.